Bai Antioxidant Infusion is a beverage made with coffee fruit and white tea extract. It is further enhanced by the use of natural fruit juices. Bai is currently distributed by The Dr Pepper.Snapple Group. 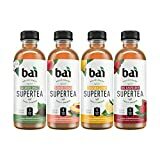 All flavors of Bai have the same amount of caffeine per bottle. Bai also makes a couple of other beverages that have differing caffeine levels. 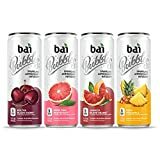 Filtered water, BaiÂ® Proprietary Sweetener Blendâ„¢ (erythritol, stevia extract), juice concentrates (blueberry, blackberry, strawberry), natural flavors, coffeefruit extract, malic acid, fruit and vegetable juice (for color), white tea extract, ascorbic acid, sodium citrate. Sugar content: 2 grams (per 18 ounces). 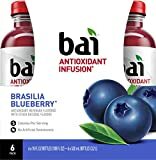 Bai Antioxidant Infusion contains 3.89 mgs of caffeine per fluid ounce (13.15mg/100 ml).